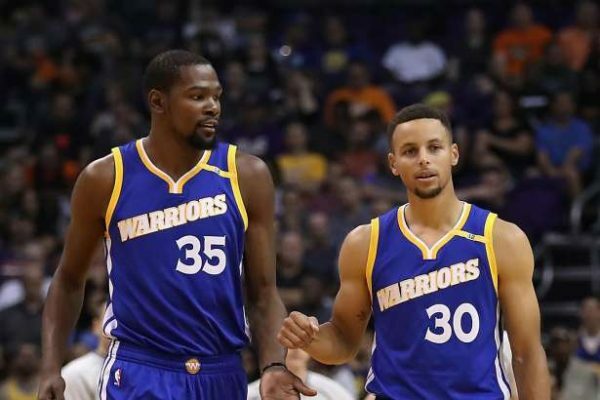 One of the main concerns regarding Kevin Durant joining the Golden State Warriors was the new distribution of shots between star players. Three games into the new season isn’t nearly enough time to establish solid conclusions, but we wanted to have a look in any case. The Warriors are playing at a slightly higher pace through the first 3 games this season (103.0) compared to 99.3 through last season, but actually taking one less shot per game. Durant, the main change on the team, is averaging 16.7 field goals per 36 minutes, 2.6 less than last season. He’s actually scoring more points (31.3 per game so far), but that’s because he’s gone to the line a lot more through the first three games in Warriors uniform, which one of the they lost. Surprisingly, Draymond Green hasn’t been the one who has “lost” shots. He’s actually taking one more shot per 36 minutes (11.4 compared to 10.5), although he’s only making 36.4% of them, helping explain his scoring decline so far. Stephen Curry has “lost” shots, taking 2.2 less per 36 minutes compared to last season, but that was expected that Curry would defer some of his offensive dominance to Durant. How about Klay Thompson? He’s gone down in field goal attempts as well, taking 15.8 per game per 36 minutes compared to 18.7 last season. If Green continues to shoot as poorly as he has, we might see Kerr try to move the offense through Thompson more, although with Green and Kerr having a history of clashes, and Green being the much better passer, who knows how well that will go down. Another player, although not as dominant offensively but just as important to the big picture on the Warriors, is Andre Iguodala. He’s been taking 1.2 shots less per 36 minutes through the early going of the season. Zaza Pachulia, so far, is getting the same amount of minutes as Andrew Bogut last season, and their shot production is similar. However, the Warriors will tweak their rotation and lineups as the season advances, due to Pachulia not being as good of a rim protector. Overall, the Warriors don’t seem to have any drastic changes going on in terms of pure numbers. As for their ability and actually passing the eye test, it’s clear that their defense isn’t as comfortable and imposing as it was, and the offense is going to take time. Luckily for them, they have someone like Durant, with probably the best offensive skill set in the NBA, to overcome “team” issues, making up for it with his individual skill once things get stuck. The goal is to eliminate that most of the time, but at the moment that’s the best offensive weapon Golden State have.